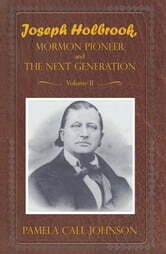 Read about the settlement of Utah through the words of Mormon Pioneer, Joseph Holbrook, as written in his journal. Also included are stories and commentary on The Next Generation who went into Star Valley, Wyoming, to settle when outlaws infested that region. Among the most interesting of these was Butch Cassidy. Fresh insights into Cassidys life and why he became an outlaw are revealed side by side with the life sketches of Anson Vasco Call II, the first mayor of Afton, Wyoming, and other stories of the settlement of the area. Shown here is the LDS tabernacle in Bountiful, Utah, (top) that Joseph Holbrook helped build and the LDS tabernacle in Star Valley, Wyoming, (bottom) that his grandson, Anson Vasco Call II. helped erect. Joseph Holbrooks legacy is far-reaching and extensive and includes the accomplishments of his many descendants.